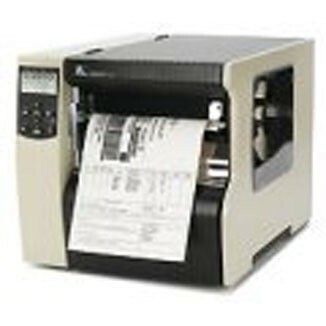 220Xi4 Direct Thermal-Thermal Transfer Bar Code Printer (203 dpi, Serial, Parallel, USB, Internal ZebraNet 10/100 PrintServer, 120VAC Cord-NA, 16MB SDRAM, ZPL II, XML, Clear Media Side Door and Media Hanger) Designed to produce large labels up to 8.5 inch (216 mm) wide at 10 inch (254 mm) per second at 203 dpi and 6 inches per second at 300 dpi (152 mm) resolution, the 220Xi4 is ideal for industrial applications - chemical drum (HAZMAT) identification labels, pallet/container shipping labels and product identification labels for large rolls of paper or textiles. Label Width: 4.125 in. - 8.675 in.